FUSION ACADEMY is excited to share the unique art of BRAZILIAN JIU JITSU and KICKBOXING with your child! FACE DOWN the school bully with our Bullystopper® techniques while gaining real confidence in school. ALL Fusion Academy students who learn Jiu Jitsu and Kickboxing have seen they are more confident among their peers and capable of defending themselves verbally or physically using the unique Gracie Jiu Jitsu system. At FUSION ACADEMY we love sharing THE ART of Jiu Jitsu and Kickboxing. We have seen many of our students faced with challenges of confidence, weight issues and social anxiety and have overcome these obstacles with our unique curriculum! ENROLL TODAY and experience the LIFE-CHANGING results of what Fusion Academy has to offer!!! Professor Eddie Edmunds learned Gracie Jiu Jitsu from Master Pedro Sauer. Master Sauer is a Rio de Janeiro native and learned Gracie Jiu Jitsu directly under Grandmaster Helio Gracie. Professor Edmunds has travelled to Brazil and learned under the Gracie Family. 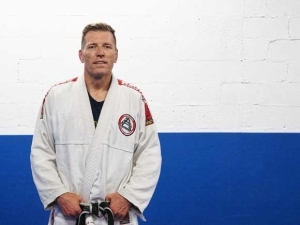 He has studied and taught martial arts for 30 years and has worked with Navy SEAL’s, SWAT Teams and taught Women’s Empowerment Seminars to numerous groups in the United States. Professor Edmunds is available for workshops, speaking engagements and corporate training seminars. The UNFORGETTABLE Renzo Gracie Seminar That Almost Didn’t Happen!